MS Sathyu’s Garm Hava remains a potent and evocative study of the ramifications of Partition on the lives of ordinary, innocent people. Relevant even today, 41 years after it first released in 1973, the film, now digitally restored, has been re-released theatrically across the country. Deemed controversial initially due to its politically sensitive theme – the plight of Muslims who decided to stay on in India post-Partition – Garm Hava came to be celebrated subsequently for the honest, humanist approach that Sathyu and actor Balraj Sahni brought to this critical story that alternately evokes feelings of anger, helplessness, and hope. At the heart of the film is Sahni’s moving, restrained performance as Salim Mirza, a local shoe manufacturer in Agra trying to resist the economic pressure and political bigotry that tempts him to abandon his family business and immigrate to Pakistan. Forced to give up his ancestral home, rejected by banks and moneylenders for a loan, and accused of being a Pakistani spy, Salim and his family are victims of the titular scorching winds of communalism and intolerance that gripped the nation at that delicate time. There are stirring performances also by Geeta Kak, playing Salim’s daughter Amina whose love is twice thwarted, and by a young Farooque Shaikh in the role of Salim’s son Sikander, a college graduate struggling to find employment in a prejudiced society. There are moments of great power and pathos in Garm Hava. Like one in which Salim’s aged mother must be lifted and carried away because she refuses to give up the home she has lived at since she arrived there as a child bride many moons ago. Or the one in which Salim discovers his daughter’s lifeless body. Or the film’s climax, in which Salim, finally having decided to move to Pakistan, finds the reason he needs – a glimmer of hope – to stay on and take charge of his life. 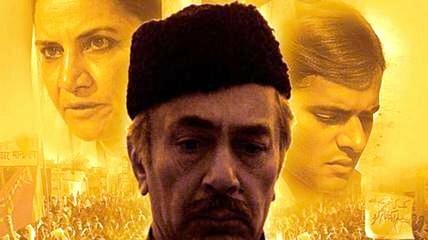 A precursor to the many Hindi films made on the subject, Garm Hava is possibly the most thoughtful cinematic meditation on Partition and its aftermath. It’s an important film for our times, and stands as a scathing reminder of the terrible mistakes we made.